Everpure filters should be mounted using Everpure mounting brackets to support the weight of your filter system and the brackets will prevent twisting when changing your Everpure filter. The Everpure EV3111-26 Filter Housing Mounting Bracket is a mounting bracket kit that fits 10" and 20" Pentek, Ametek, US Filter housings with 3/4" Female NPT threads. 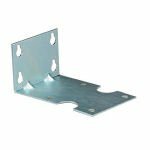 This compatible Everpure mounting bracket also includes screws.